Launchpad couldn't import bug #664683 from GNOME Bug Tracker. Laptop screen resolution is 1280x800. 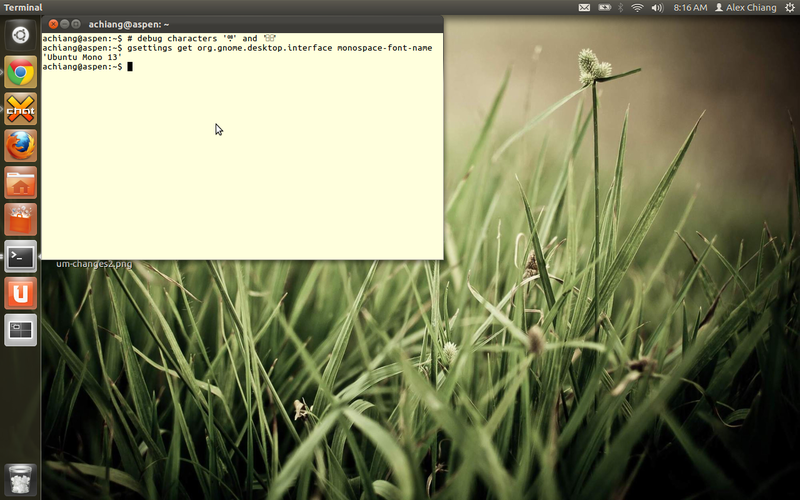 Set gnome-terminal font to Ubuntu Mono 11. In Oneiric, I was able to fit two terminals side by side without any overlap. In fact, they fit without overlap and without causing the launcher to autohide. After upgrading to Precise, the terminals now push over into the launcher area, causing it to autohide, and even then, they still overlap. 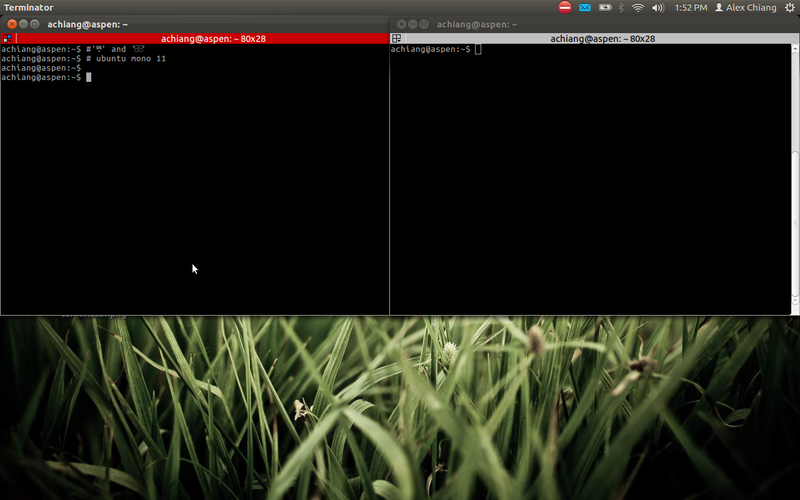 Notice the terminal on the right, the 'a' in 'achiang' is covered up by the terminal on the left. however that would give an overlap of ~40 pixels instead of 6 pixels. It's possible that the 6 pixels are accounted for by non-zero width borders. Could you please try to see if you get the same with terminator (terminal emulator) if so that's a vte issue. "shrinking terminal on tab switch"
Alex: I've forwarded this upstream. If it's important to you, would you be able to state your case there? This has happened to me also in precise with Gnome Terminal. 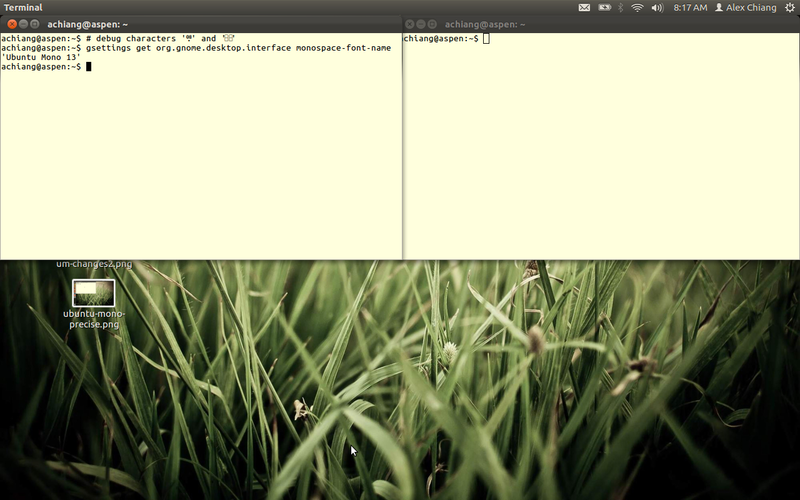 In oneiric, I used to be able to get two 80-wide Terminals next to each other with Ubuntu Mono 14 in a 1600x1200 screen. In precise, these overlap now and I have to bump them down to UM 13, which isn't as readable and also feels like there is more space between characters. Interestingly enough, I did not have to change my Emacs settings, where I have two 80-wide windows using UM with a "height" of 136 (Emacs claims they are 1/10 pt settings, so I'm not sure if those are 14pt, 13pt or 13.6pt - in oneiric they looked the same as 14pt in Terminal, IIRC). I'll upload some precise screen shots soon. After chatting with Alex on IRC, this is definitely the same bug, so screen shots probably aren't necessary. Unfortunately, neither of us understand how to test out the workaround in comment #9 :/ Seems like upstream doesn't think this is a regression. We appreciate that this bug may be old and you might not be interested in discussing it any more. But if you are then please upgrade to the latest Ubuntu version and re-test.